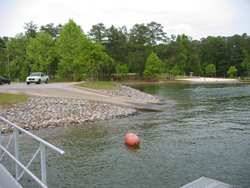 There is a swimming beach, picnic tables, and a boat launch at Old Highway 41 #1 day use park. A $4 per vehicle fee is charged for using any of the facilities. This fee can be paid at the park entry booth or, on days when it is not staffed, at self serve collections boxes. 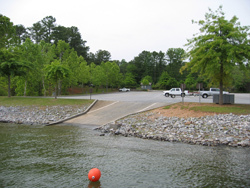 The boat launch is a single lane ramp. There is a boat loading dock - 10 minute time limit, no fishing, no swimming, no sunbathing. The parking area and launch access provide ample room for maneuvering your rig. 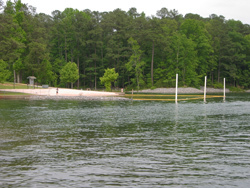 The swimming area consists of a sandy beach and a roped off area of water for swimming. There are no lifeguards. There are a few picnic tables with grilles in this day use area. They are located along the edge of a small stretch of water but are unshaded. You have a view of a small slice of water and the parking lot. 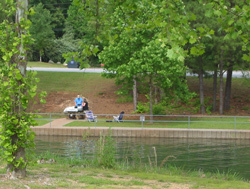 While there are nicer places to have a picnic at other Lake Allatoona parks, it is nice that these facilities are here. You can cook some burgers and hot dogs while taking the kids for a swim or after pulling your boat out of the water.